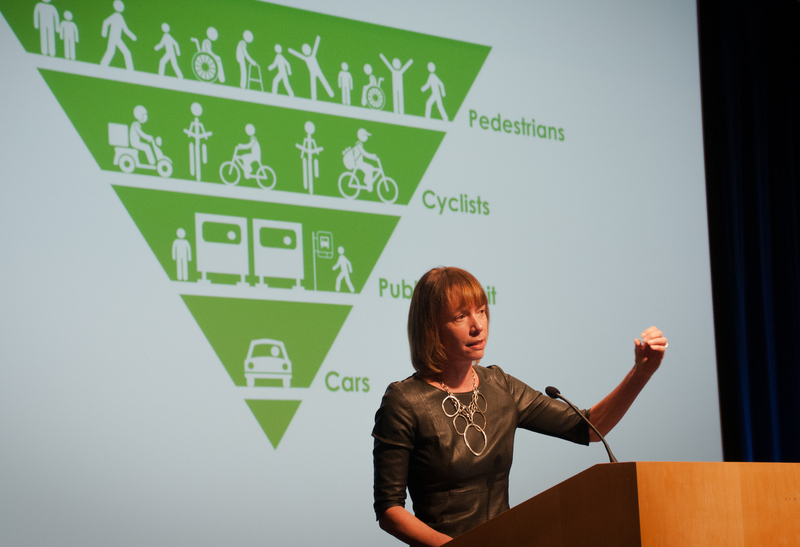 With decades of experience in transportation issues within the private and public sectors, Janette Sadik-Khan is undoubtedly an expert. But after six years spearheading some of the most pioneering approaches to people-first street design while leading the transportation department in America’s most populous city, today she’s also a bit of a legend. She’ll be sharing her insights with participants at our conference, Intersections: Creating Culturally Complete Streets in Nashville April 3-4. Register now. Streets are some of the most ubiquitous and valuable public spaces that a city has. And few people know that as intimately as Janette Sadik-Khan. From 2007 to 2013, Sadik-Khan was the commissioner of the NYC Department of Transportation and today she continues working as a sustainable transportation consultant with Bloomberg Associates. During her six years with NYC she showed her city—and the country—what can be accomplished when we put people first in transportation planning. Perhaps most famously, Sadik-Khan closed five blocks to cars on Broadway through Times Square and expanded the space for people as an ad-hoc park. With some paint and lawn chairs from the hardware store, the project was initially temporary. Then the results came in: crashes declined, travel times improved, and business was booming. Those outcomes were enough to convince Mayor Michael Bloomberg and other stakeholders to make the installation permanent, creating new space for people in one of the world’s busiest cities. With those tools in hand, Sadik-Khan lead the creation of more than 60 pedestrian plazas like the one in Times Square across NYC, converting more than 26 acres of car lanes into spaces for people. This tactic has since been utilized from Boston to Buenos Aires. She built nearly 400 miles of on-street bike lanes, including the first parking-protected bike lane in the country, and launched the Citi Bike bike share program. Under her tenure, the number of people biking doubled in the city. And some of the city’s most congested bus corridors also saw improvements, with 57 miles of dedicated bus lanes and pre-board payment systems helping improve speed and reliability. More important than her specific accomplishments in NYC, Sadik-Khan showed what’s possible with some paint, creative thinking, and a human-centered approach. Communities big and small have used these same techniques to create change on their own streets, and examples abound: In Macon, GA, a bike lane demonstration project boosted biking by 800 percent and has led to the creation of permanent lanes. In Everett, MA, the city used simple orange cones to create a temporary bus lane that decreased travel times for both buses and cars, and has the potential to be a model for other towns around the country. Today, Janette Sadik-Khan continues creating people-friendly, efficient, and sustainable streets at Bloomberg Associates, a philanthropic organization that works directly with mayors around the world to improve the quality of life of their residents. 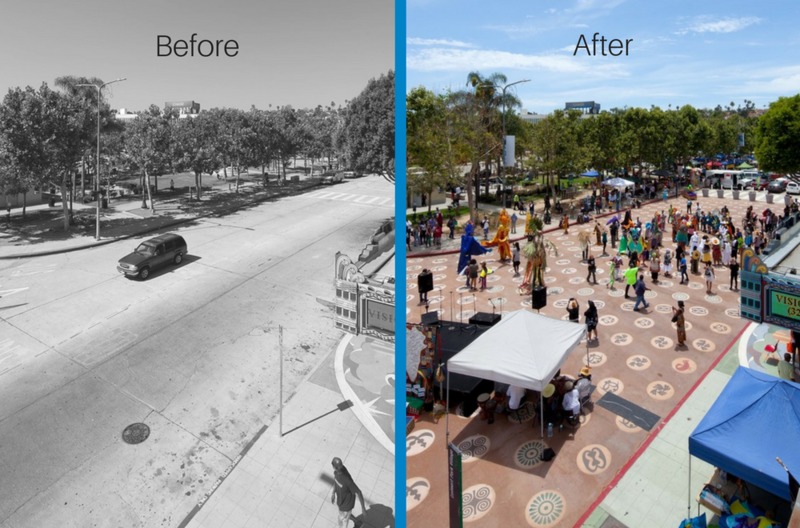 At Intersections, we’ll explore how arts and culture can help communities design streets that solve their unique transportation challenges and reflect their local character. Sadik-Khan’s experience doing exactly that both in New York City and working around the world makes her an exciting addition to our roster of keynotes and panelists at Intersections. Register today. The conference is just over a month away!